HomeTravel ArticlesBeach ArticlesYour Home-Base to Endless North Coast Oregon Adventures! Along the beautiful coast of the Pacific Ocean is a place where you can take a break from the rest of the world. Leave your worries behind and breathe in the refreshing natural air on a vacation with your family, friends, or sweetheart in the heart of Oregon's North Coast. This is where you'll find the ultimate vacation experience. From the moment you arrive at the Inn at Cape Kiwanda, you are sure to fall in love with the laid-back coastal vibe of this charming retreat. The inn features a collection of elegant rooms and suites that are ideally furnished with gas fireplaces, microwaves, and coffee makers. You can even book a room with a jacuzzi for a little added luxury. Plus, every one of their rooms offers a private balcony with ocean views! Of course, don't spend all your time in your room. What really makes the Inn at Cape Kiwanda stand out from the rest is their unbeatable location. 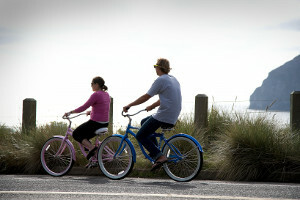 The inn is minutes away from downtown Pacific City, the soft sandy shores of the beach are right across the street, and plenty of exciting year-round activities and attractions are a short bike ride away. You can even grab a complimentary bike onsite to head out for your adventure! Visit the local shops and restaurants such as the Meridian Restaurant & Bar, which offers ocean-to-table meals, and Pelican Brewing Company, where you can bask in the ocean views while indulging in a great drink. There's also the Stimulus Coffee + Bakery, located on the inn's ground floor, that serves up fresh-brewed coffee and delicious pastries to satisfy any craving. And when you're looking for a little more entertainment, not to worry. Horseback riding is available at Green Acres Beach & Trail Rides, while Nestucca Adventures offers kayak rentals for incredible trips down the Nestucca River. You can also simply spend an afternoon out on the shores building sandcastles, searching for seashells, or flying a kite from Catch the Wind. 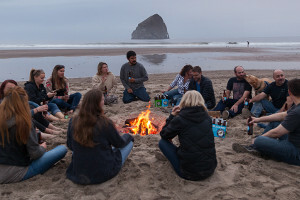 So whether you're here with the family over the kid's summer break, celebrating an anniversary with your significant other, or looking to reconnect with some friends on the coast, the Inn at Cape Kiwanda offers the perfect place to call your Oregon home-away-from-home. There's no better place than this for a truly special North Coast getaway.